Despite the administration's claims, only 60 percent of unauthorized border crossers are being prosecuted. The detention centers are out of room. McALLEN, Texas — Attorney General Jeff Sessions says the Trump administration has a "zero-tolerance" policy for unauthorized border crossings. But interviews with migrants by NBC News show that not everyone who crosses the border outside of designated ports of entry is being criminally prosecuted, or is being separated from their children for long periods. Some children and parents are only briefly separated at a detention center, then reunited and released from the facility days later. Compared to the 2,000 children who have been taken from their parents by the administration, they are known here at the border as "the lucky ones." Cristina Melgara, from El Salvador, was one of hundreds of adults who released this week with an ankle bracelet, so she could be tracked until her appearance at an immigration court. She was briefly separated from her 10-year-old son, Robert, and her 16-year-old daughter, Aracely. After six days, the family was reunited and released. They were transported by U.S. Immigration and Customs Enforcement to the bus station in McAllen. From there, they walked down the street to a Catholic Charities shelter run by Sister Norma Pimentel. “We call them the lucky ones,” said Pimentel. The volunteers in her shelter provide a shower, a clean change of clothes and a packet for immigrant families that helps them find their way on the Greyhound bus system: to friends, family or the site of their first court appearance where they can make an asylum claim. In contrast to the administration's claims that all parents will be charged in federal court, the Department of Homeland Security told NBC News they are actually prosecuting only 60 percent of those who have crossed the border illegally between designated ports of entry. 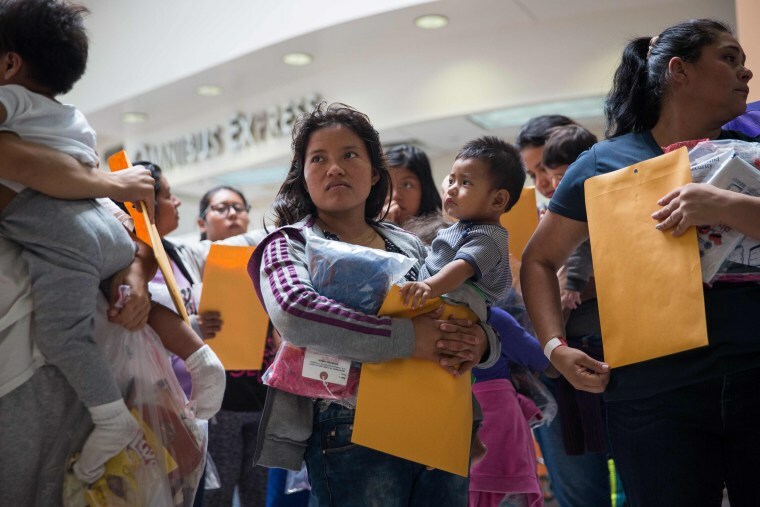 The reason for the discrepancy, according to one former DHS official and one current one, is that the detention centers at the border don’t have enough space, so some families are released into the United States. It is not clear why DHS is separating children from parents even briefly if the parents are not going to be charged in federal court, and DHS did not respond to questions about the practice. politicsTrump says separation isn't his policy. Here are all the times his team said it was. The Melgaras spent 17 days making the trek from Central America to Mexico to flee gang violence, said Melgara. Gangs kidnapped Aracely for four days, and the Mara Salvatrucha gang, known as MS-13, tried to recruit Robert, threatening him with killing his mom and sister if he didn’t join. Robert said he did not expect to be separated from his mother when he reached the U.S.
Wendy González, 29, is a mother of three from Honduras who was also detained for a brief period. She said her daughter Ashley, 10, was taken from her arms by agents after she crossed the border. Ashley started to sob as she spoke of what happened. “I did not like being separated from my mom,” said the girl, describing how she slept on the floor and wrapped herself up with Mylar blankets to stay warm. “I was sleeping in a room filled with people and it was a cage,” she added. González said she held on to her year-old baby, Sophia, and her 6-year-old, Bria, while looking at her eldest through what she referred to as a fence. “I tried to talk to her through that fence. I gave her hope so that she could be strong,” she said crying. Ramón Rosas, who is from Honduras, said he spent five days separated from his 4-year-old son after they crossed the border. For now, he is thankful to be heading to Maryland with his son. Despite an ankle bracelet and an immigration court date, he considers himself fortunate he can hold his son at night. There may be fewer families like these if the policy continues. Trump administration officials told reporters on Friday they want to increase manpower at the border to reach their goal of 100 percent prosecutions, meaning all parents who cross illegally would be separated. Mariana Atencio reported from McAllen, Texas, and Julia Ainsley from Washington.